At any price these would be great speakers; at this price it's hard to think of anything that can touch them. Truly great sounding monitors. Excellent build quality and ergonomic design. Astounding value for money. At twice the price they'd still be great. Sonodyne has been selling to the Far East for many years but now, with the support of distributor The Audio Pros, it's found a route into Europe. 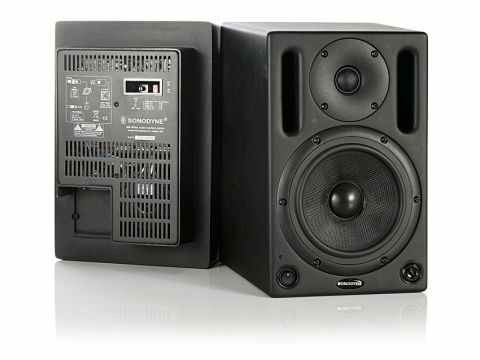 The SM100 is the mid unit of a three-speaker range starting with the smaller SM50 and ending with the larger SM200. Straight out of the box the all-black units feel substantial and look very well put together. The cases are matt black aluminium and the front sports two ports, one either side of the one-inch silk tweeter and a 6.5-inch Kevlar woofer. There is a blue mains indicator LED next to the power switch and the only other thing on the front panel is a continuous volume control to the bottom right. The rear panel houses the amplifiers (an 80W for the low end and a 40W for the high), the IEC mains socket, XLR and TRS input sockets and a recessed panel with another volume control (+/- 6dB) and a set of dipswitches for bass and treble roll-off and tilt. The finish is excellent and there are even pin diagrams for the connectors on the back panel so you don't have to check in the manual. The fun part of reviewing a new pair of speakers is hooking them up to your system and digging through the CD collection. We tried the SM100s with every style of music available to us and, frankly, we were stunned by them. If we had to sum them up in one word it would be detail. The midrange is quite incredible. Crisp, precise and extremely tactile. They project out into the room and give you a real sense of the space around the music. We heard things in some recordings that we'd missed before. "Whether mixing, playing or recording, the SM100AKs hit the spot every time." The bass response is also superb. It's very even and extends a good way down despite the size of the drivers and cabinets. Cranking up some heavy dance tunes filled the room and these boys pack a punch at volume too. There is a tendency with a lot of modern speakers to over emphasise the really high frequencies but not with the Sonodynes. Ultra highs are smooth and crisp but never get in the way of the mids and bass, which is where the music is. So, having decided that we liked listening to other people's work on them the real acid test was to stoke up the computer and try recording with them. Again, the Sonodynes impressed: whether mixing, playing, or recording, they hit the spot every time. Getting the sound was straightforward, no dead spots and no moments of indecision (above and beyond the normal ones that is!). Everyone who's heard them has liked them and enjoyed the experience of playing to them. Their superb precision tells you right away if you've picked the wrong mic or the wrong EQ. In these days of ever diminishing budgets workflow is king and anything that helps you move things along a bit faster is worth its weight in gold, or at least hard cash. These speakers come highly recommended.